I ran across this dish on a month-long visit to Istanbul. Eggplant was in season at the time and we were able to sample quite a few dishes that were new to me. I love traveling to places that aren’t afraid of variety, spice and flavor – Istanbul is one such place. This dish is served room temperature or cold as a light meal or a starter. The name of the dish in Turkish, Imam Bayildi, translates literally to “the Imam fainted”, presumably due to happiness. That gives you an idea of how wonderful it is. The other version of the story is that the Imam fainted after he learned that his new wife used up all of the expensive olive oil they received for their wedding by making this dish several days in a row (his favorite). Some versions of the recipe ask for 1/2 cup of olive oil or more – this is a slimmed down version. Place the onion slices in a bowl with the salt. Roughly squeeze them between your fingers until they become limp. Add the garlic, sumac, red pepper flakes, honey, fresh herbs, tomatoes and tomato paste to the onions and mix thoroughly. Method #1: Wash and dry the eggplants. Using a sharp knife, cut off the leaves but leave the white stem core. Place each eggplant on the table to gauge where they will lie flat. On the opposite surface peel off a ribbon of the skin, being careful to allow about 1/2 inch of skin intact on each end. Remove the white part of the flesh under the slice to expose the seeds. Score the inside of the eggplant without piercing the skin. Remove another smaller ribbon of skin on either side of the top peel (optional). Now press the white flesh inside the eggplant with your thumbs, being careful not to puncture the skin. This will create a cavity for stuffing. Method #2: Wash and dry the eggplants. Using a sharp knife, cut off the leaves leaving the white core of the stem. Remove a ribbon of skin on the top being careful to allow about 1/2 inch of skin intact on each side. 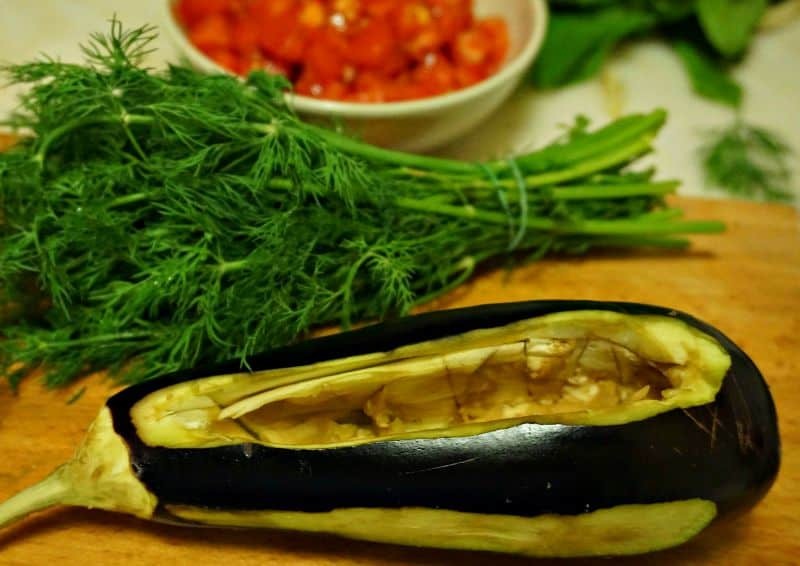 Brush them with olive oil and then place the eggplant in a 400 degree oven and bake until the skin starts to blacken (about 20 minutes). Allow them to cool and drain (opening side down) for 20 minutes. Stuff each eggplant with the onion/tomato mixture pressing it in firmly. Place the eggplants side by side in a sauce pan so that they fill the space inside. Heap additional stuffing on top of each one. Drizzle them with the olive oil. Fill the pan with water until it reaches 1/2 way up the side of the eggplants. Bring the water to a boil and reduce the heat to simmer. Cover the dish and allow it to cook for 45 minutes, basting with the cooking liquid occasionally. Continue to cook until the onions become translucent (this could be 1 hour or more). Allow the pan to cool. You can remove the eggplant and serve them each on individual plates when they are room temperature. But if you can wait they will have more flavor if you keep them in the sauce pan overnight and serve them cold the next day. This dish is also a typical addition to a Turkish Mezze (appetizer) platter. In Istanbul, when you arrive at a restaurant it isn’t long before the waiter comes along with a tray of mezze samples to order and enjoy with friends. It’s one of my favorite ways to eat. Here are a few addition recipe ideas to create a mezze appetizer platter at home. Eggplant is one of those veggies that you love or hate. I never used to like it, but have been experimenting with it and it now has become a fav in our house. Same here – so surprised that it is now one of our favorites too. 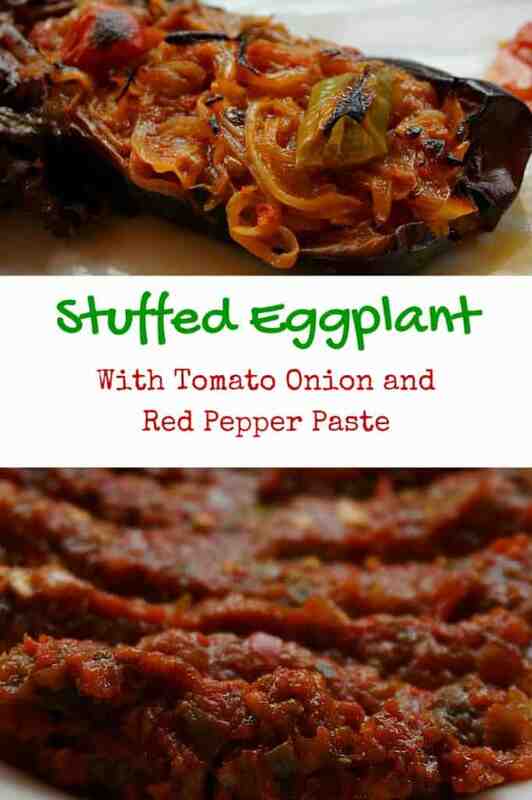 I love stuffed eggplant. In Turkey, they are everywhere, with many different versions. 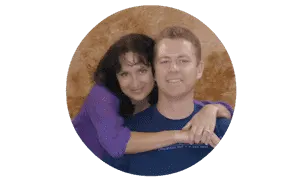 They are gloriously rich. Yum. 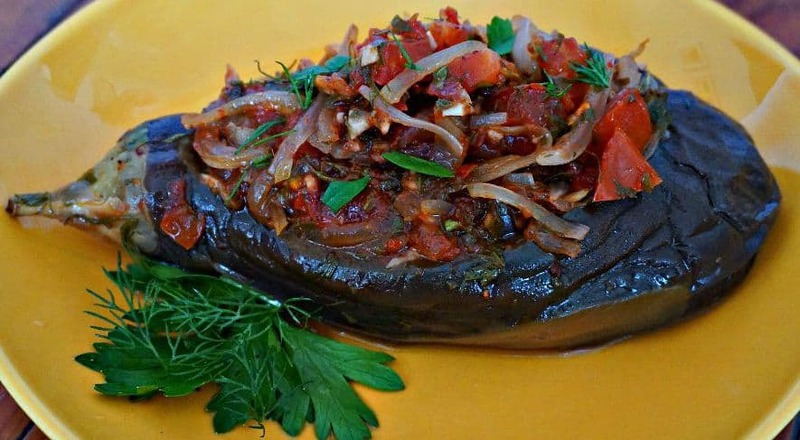 This stuffed eggplant looks delicious. I would love it served with fresh, crusty bread for dinner, or as part of a mezze platter. Yum! Isn’t any dinner better with some good crusty bread?